UNLOCK YOUR SECRET WEAPON TO STRESS RELEASE with this 100% natural, organic and free way to feeling better! What is the one thing that you have to do FIRST, before you do anything else? Can you guess? It's BREATHE! Research shows that the majority of people are not using their full breathing capacity, which impacts on everything you do. When you are not using the breath correctly, it lowers your Life Force - which you need to live, think, do your business, be healthy and be grounded and present in the best way possible. In this audio, I facilitate you through a breathing meditation that will help you benefit immediately. 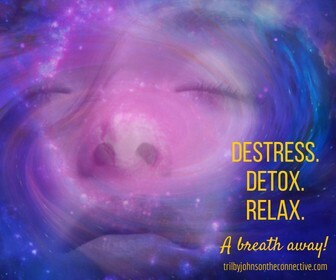 Find out how you can Destress, Detox, Relax by popping your name and e-mail in the box below and your free audio will be on its way to you ASAP! Thank you and in Light. Emotional Breakthrough Alchemist & Coach, Author, Speaker. You can change your mind at any time by clicking the unsubscribe link in the footer of any email you receive from us, or by contacting us at info@trilbyjohnsontheconnective.com. We will treat your information with respect. For more information about our privacy practices please visit our website. By clicking below, you agree that we may process your information in accordance with these terms.